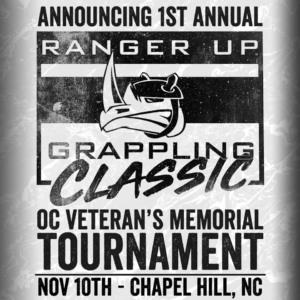 We are thrilled that the Ranger Up team is helping make our Orange County Memorial a reality by creating and hosting the 1st Annual Veterans Day Ranger Up Grappling Classic Tournament. Home of the NC Wrestling Regionals. Participants can weigh in the evening before or morning of the competition. What’s different from all the others? After Party! Clean Juice will be on site all day so you can grab some amazing açaí! Clean Juice will be on site all day so you can grab some amazing açaí! In Association with the Town of Chapel Hill, Chapel Hill Gracie Jiu Jitsu, and Clean Juice.